The reception area is marked by a sophisticated wooden desk stationed on a grey steel frame. 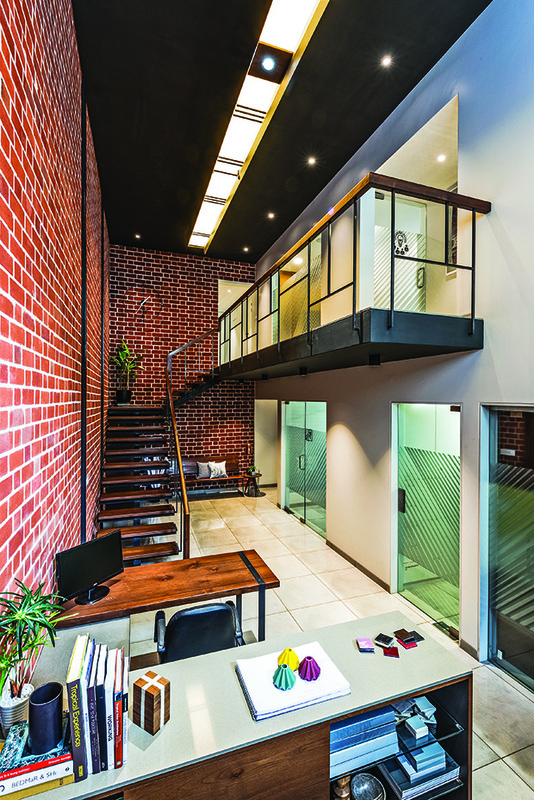 Established project management consultant Mayur P Thakkar had envisaged an office whose design would showcase detail and diversity and serve as an example of the work that his company, MPT, did. 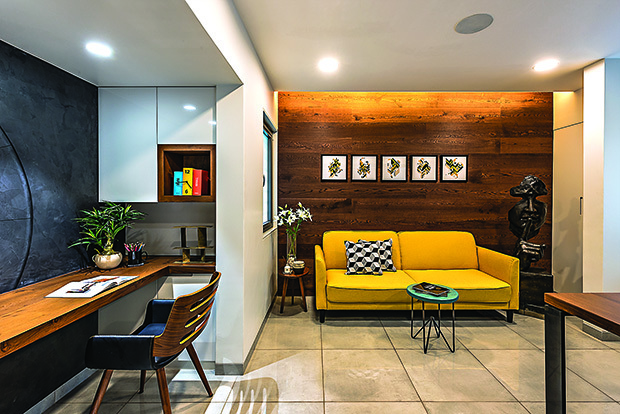 The task to create this visual demonstration to prospective clients was entrusted to Vadodara-based Usine Studio headed by interior designers Yatin Kavaiya and Jiten Tosar who are known for their clean and minimal sense of aesthetics. “We’ve worked with Mayur earlier, as he has executed some of our projects in the past. Therefore, when he insisted on letting the office be a mix of displayable possibilities of design detailing and fixtures, we knew exactly what he is expecting from us,” informs Yatin. Being directly involved in the construction business, Mayur had a keen eye for detail and was involved in discussions at every stage of the design. His wife, Ami divides her time between managing their home and being a part-time travel consultant. They both aspired for a workspace that could do justice to their personalities as well as the nature of their work. Keeping in mind the clients’ budget and their inclination towards the idea of ‘truth to detail,’ the team decided on a design where the focus was on the basics. “He was intent on stripping away the artificial. 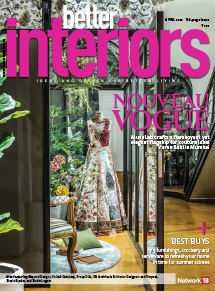 So, we took to using the raw, intrinsic appeal of materials like concrete and brick with overtones of steel and wood,” says Jatin about the material palette that was chosen for the project. 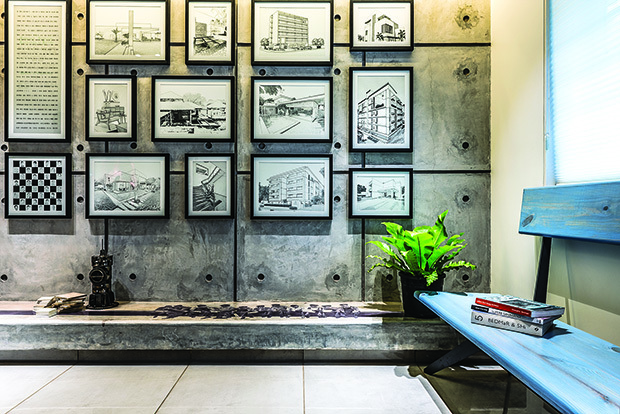 The exposed concrete of the reception transitions into brick in lime mortar in the spinal double height workspace. The designing team began by making some crucial civil changes in the layout. The fresh site was situated in a residential complex and was meant to be a duplex. The location of the staircase according to the larger complex was changed to one on the interior face of the duplex. The main entrance was also moved from what the conventional framework had allowed. A dark grey metal panel with a skyline etched upon it serves as the entrance facade. 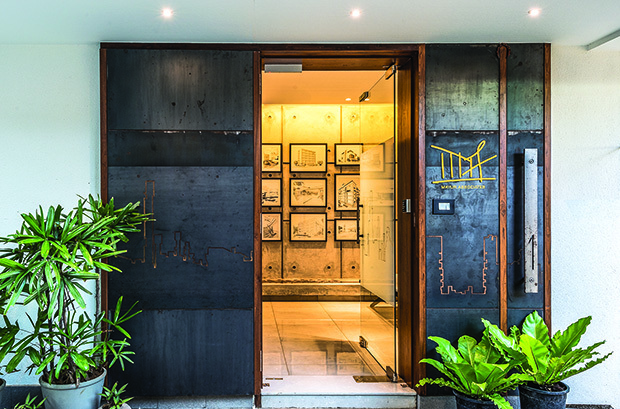 A glass door within a wooden frame leads one into a reception area, where the focus wall of exposed concrete is adorned with a pixel-like collage of the PMC firm’s works, boldly framed in black. The monochromatic expression of this wall is underlined by a clean light grey RCC ledge that almost hovers at the base above its own shadow. The reception desk was designed with an intention to reveal its structural basics with the wood supported on a single metallic frame. An aged blue wooden bench is a subtle source of colour in this otherwise neutral setting, highlighted by diffused pale yellow light. 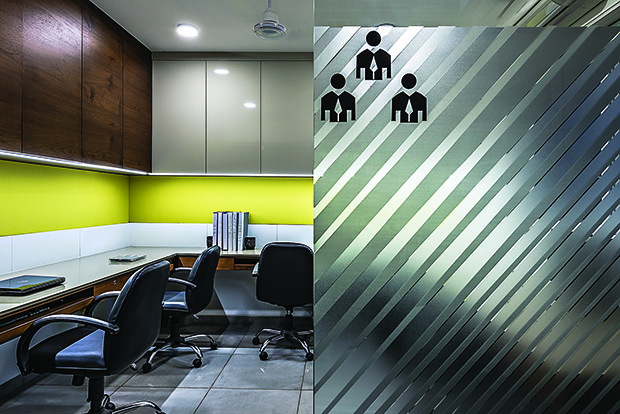 The wall leading towards the meeting space is endowed with a white-on-black graphic of ‘men at work’, signifying the construction processes that are the backbone of the company’s business. The double height space is held together with structural steel members and a visually weightless mild steel, wood-clad staircase. The admin’s desk too has an architectural language, behind which are wooden storage shelves abutting the discussion area. These shelves offer handy storage for drawings, models and samples that can be easily accessed when needed during a discussion with a client or the staff. The desk is lit up with concentrated lighting. The workstations for the staff are set close to the admin’s work desk but separated by a glass partition with frosted film that is slightly staggered on the two surfaces. This creates a subtle play of translucent shadows that silently animate the workspace. A pantry is located such that it allows common access from the staff and admin spaces. This area is marked with interesting infographics. The monochrome textured artwork of a globe overlooks Ami’s cozy work niche. The ground floor also accommodates the staff lounge which is covered with a mild steel pergola. 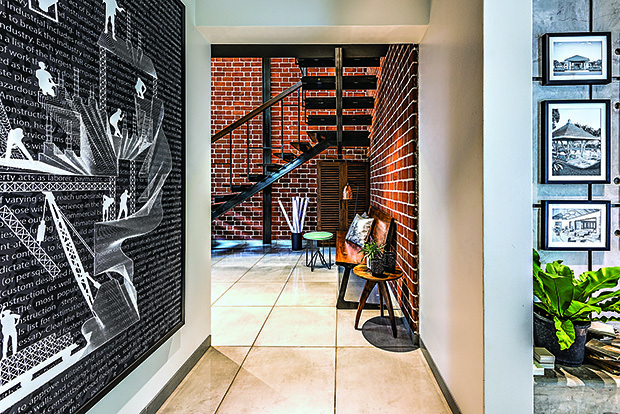 The area is designed such that it imparts a playful vibe. 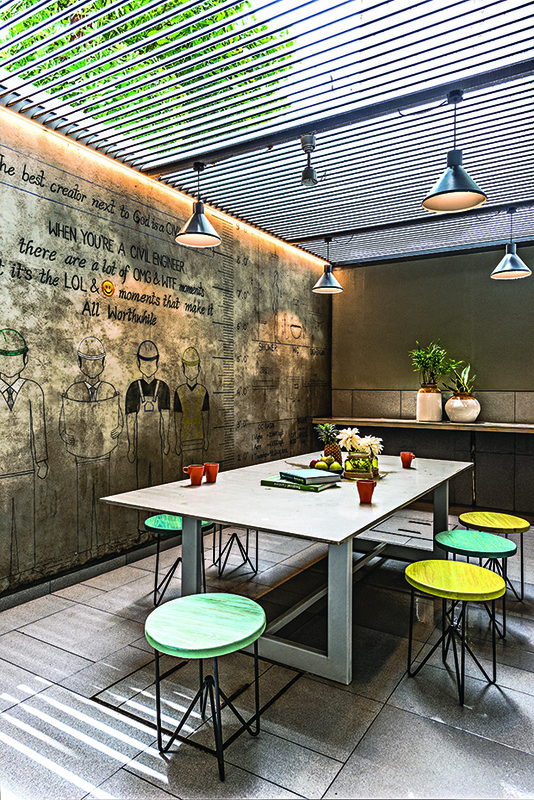 The exposed concrete walls are complemented with a neutral light grey table in the centre around which tiny pastel-hued stools have been arranged to jazz up the place. One of the walls has been painted with a mural of conversion standards, international paper sizes and some quirky quotes related to project management and construction, showcasing a light-hearted take on the company’s work. On the other wall runs a ledge that has a stove and storage units. Two flights of a mild steel, wooden clad staircase run at right angles against brick walls. A minimal wooden band streaks along the run as the handrail. This visually weightless element allows access to the second level of the office that comprises a conference room situated between the owners’ cabin and a lounge, next to which is another open-to-sky staff lounge and a powder room. The conference room was designed with a neutral colour palette with just one wall painted yellow to liven up the space. The table is made of a white metallic structure that holds up custom-made white glass in a matte finish. The whole space is lit up with suspended channel lights right above the table and concentrated ceiling mounted lights over the movement aisles. The quirky work wall and staff lounge beneath natural light and foliage, seen through the pergola that encloses it. As soon as one enters the main cabin, to the left is a cleverly fitted niche that serves as a cozy, uncluttered workstation, clad in Burmese teak wood, for Ami. 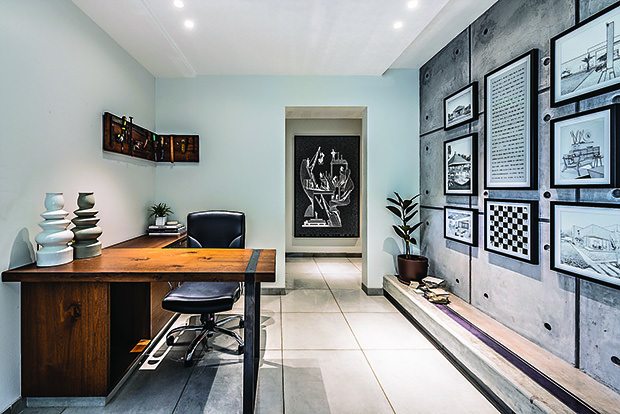 Right above, and facing a semi-upholstered armchair, is a hand-painted, textured mural by Dikshit Panchal of Drishyakar, a globe in monochrome, which symbolizes the crux of Ami’s work. The desk meant for Mayur is stately yet structural like the rest of the furniture in the office. The combination of Burmese wood and steel imbues a formal yet comfortable feel to the space. 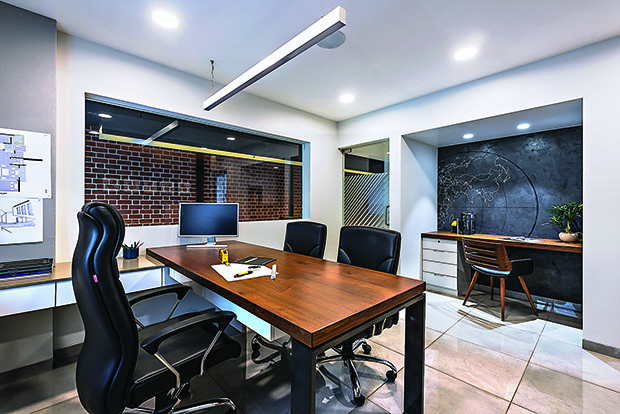 Channel lights suspended above provide focused lighting. Behind this, a large yellow sofa placed against a warm wood-panelled wall and a tiny blue side table accent the composition. This nook serves as a relaxed space where the couple and their clients can have informal discussions. An interesting aspect of the lighting design of the conference and cabin spaces is that it offers three different colours, from yellow to near-natural and finally bright white light. This can be adapted to different types of meetings and requirements and is instrumental in providing the clients with an instant experience of the mood-lighting feature. 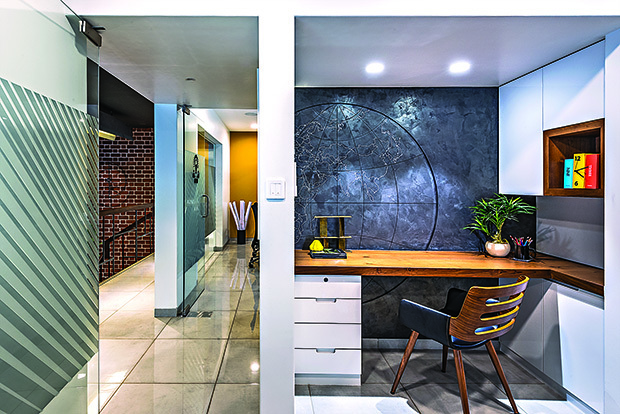 The overall design of the office space includes various examples of window frames, fixtures, and fittings that allow the entire area to become a live display of samples of the company’s work. The result is a visually light and honest workspace that moulds functionality to the client’s advantage. To use a minimal and majorly raw material palette for harmonizing the variety of structuralist pieces, fixtures, and occasional finishes. The entrance to the office is marked by a grey metal facade with a skyline and the monogram of the office etched into it, set between wooden members that also frame a glass door. The first thing the eye sees upon entering the office is this light grey washed concrete where the bold black on white collage of the firm’s works makes an instant, word-free statement. An RCC ledge brows the wall from bottom and a pale blue bench adds a dash of colour to this muted setting. 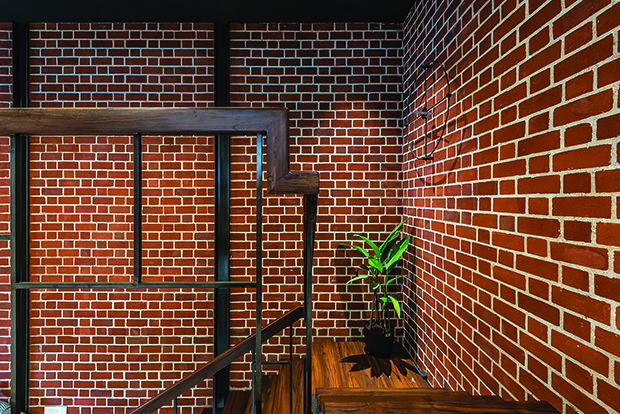 The tall Flemish bond brick walls set in steel stanchions reinforce a strict perspective in red ochre with lime highlights. 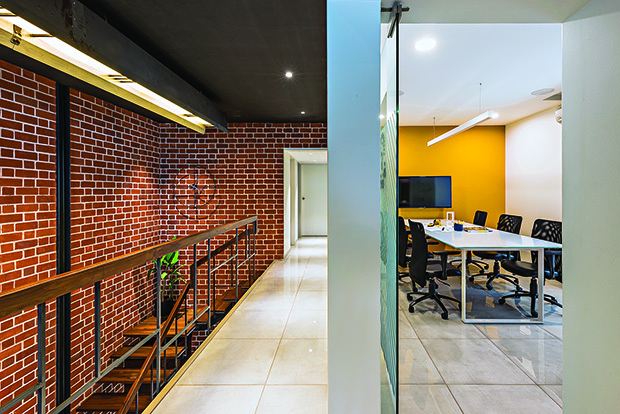 The conference room with clean white plastered walls spatially sits against the contrast of the brick-and-lime-mortared central double height. In the couple’s cabin, a yellow sofa marks a comfortable corner for casual conversations. Mayur’s desk makes a minimal structuralist expression, devoid of unnecessary flourishes, in wood and steel. The staff work station is divided from the admin’s workspace by a glass partition with staggered frosted films and infographics. The patterned translucence lends a dynamic quality to both the workstation and corridor.